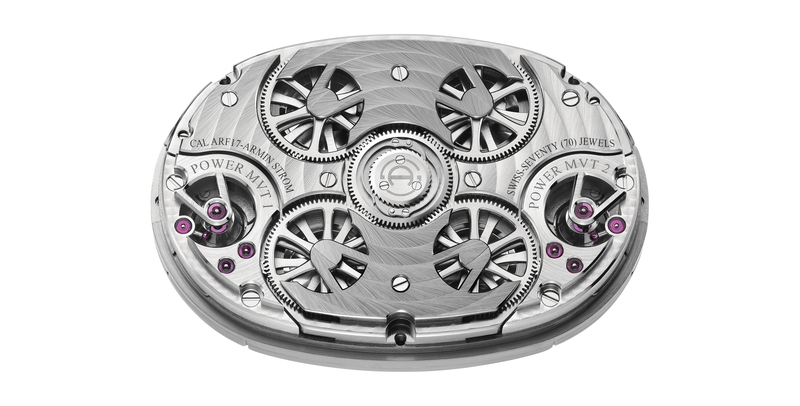 It was in late 2018 that Armin Strom announced the unveiling of its Dual Time Resonance watch –an oval beauty that is as precise as it is aesthetically and technically appealing. 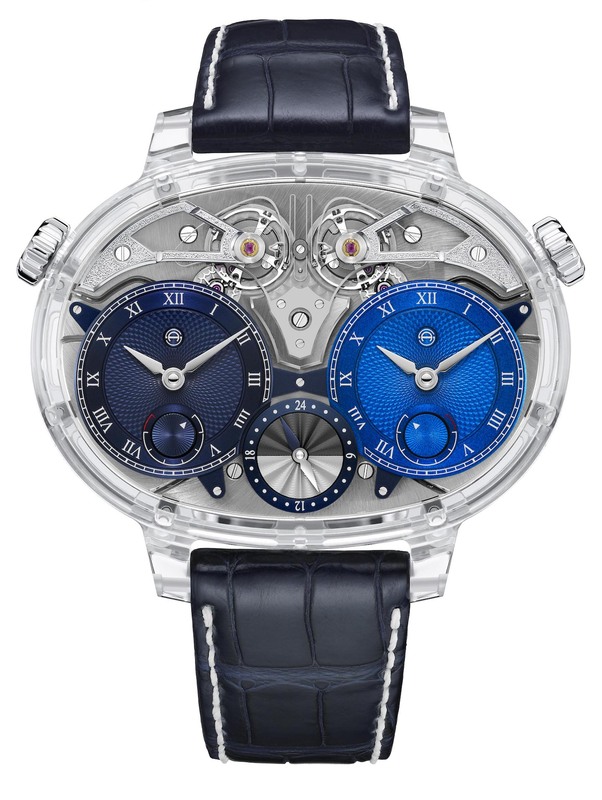 Now, just in time for SIHH, the brand releases a stunning sapphire-cased version — the Masterpiece 1 Dual Time Resonance Sapphire watch — complete with sapphire crystal case and casebook, and patented resonance clutch spring spring mechanism in the in-house-made ARF17 caliber. The Armin Strom Dual Time Resonance Sapphire is a horological masterpiece that combines two completely independent time indications with the increased precision of two independent movements in resonance — all in amazing view thanks to the transparent sapphire crystal case. 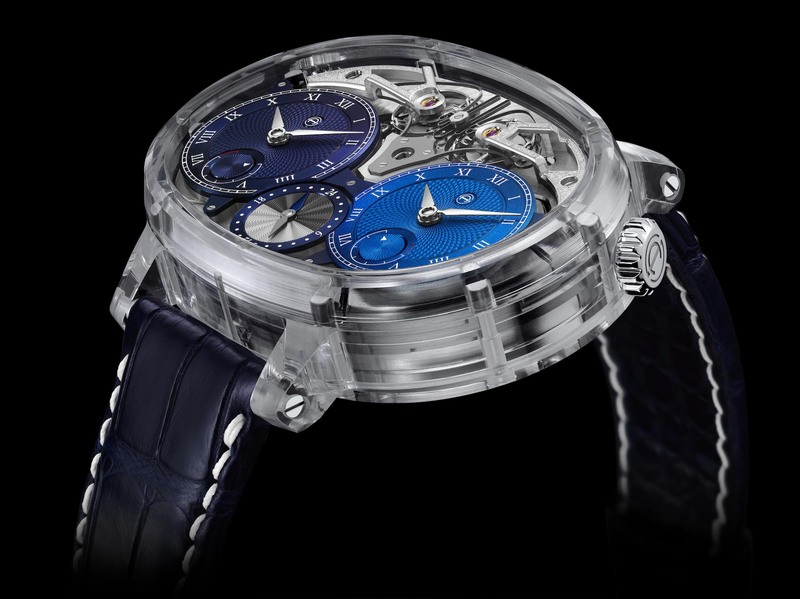 The entire case of the Armin Strom Masterpieces Dual Time Resonance Sapphire Watch is crafted in sapphire. patented Resonance Clutch Spring which was three years in the research and development stages. It connects the two movements (each of which displays time in a different zone) and synchronizes for improved chronometric precision. Of course, the watch can be use to indicate GMT, the second time zone or to act as a countdown timer thanks to the 24-hour indications on both. The Resonance Clutch spring system is certified by the CSEM (Centre Suisse d’Electronique et de Microtechnique) as being a true system in resonance. Armin Strom’s laboratory testing has revealed gains in precision of 15-20% for two COSC-certified chronometer-level regulated movements placed in resonance. 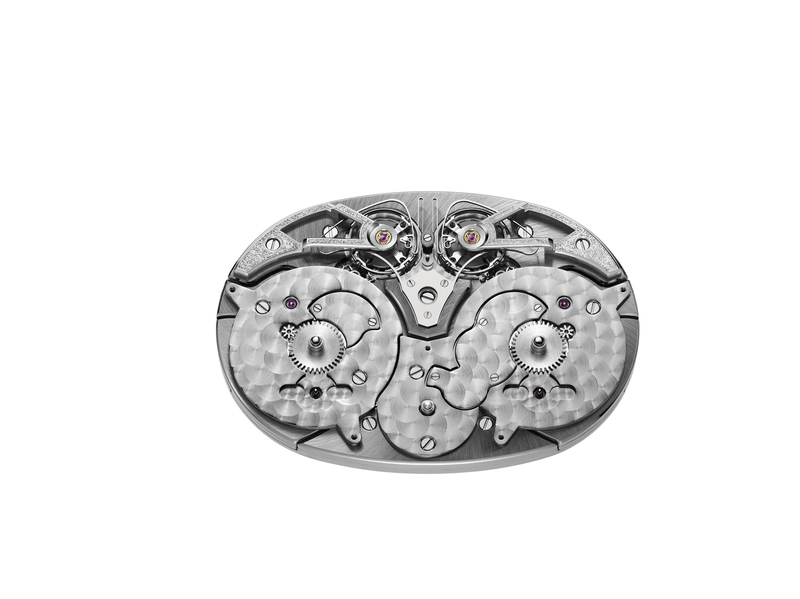 The ARF17 caliber inside the Armin Strom Masterpieces Dual Time Resonance Sapphire Watch consists of 419 parts. The Armin Strom Masterpiece 1 Dual Time Resonance Sapphire watch launches in a scratch-resistant limited edition of 8 pieces. This is in part due to the incredible time it takes to create the sapphire case. Milling, cutting, polishing and assembling the 59mm case is incredibly time consuming. It rates 9.0 on the Mohs hardness scale (a diamond measures 10) and can only be milled by using diamond tools. Of course, the hardness also makes the case rigid and the potential for chipping or cracking comes into play. As such, the manufacturing process is very long and complicated. Then the case is polished for days and transformed from opaque to crystal clear. 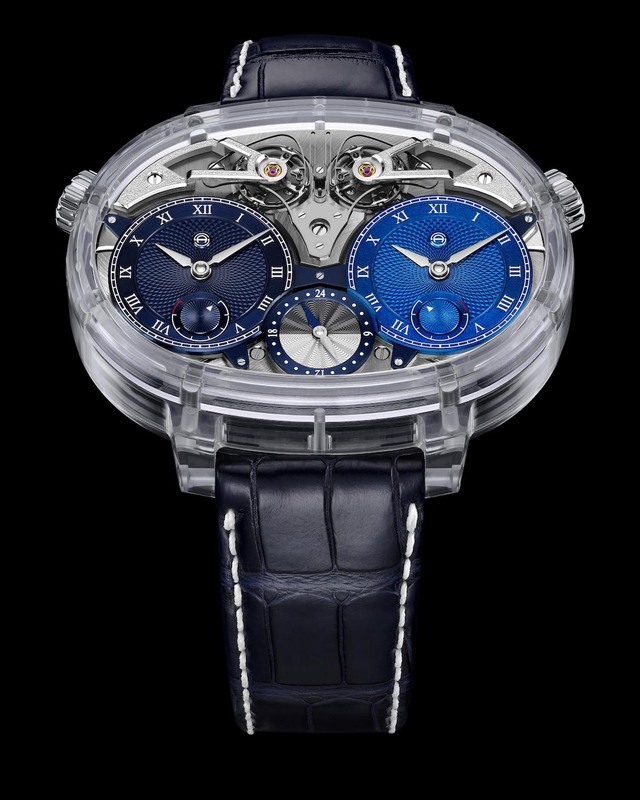 Each watch retails for about $280,000. Precise resonance is achieved via two separate movements. “Any body in motion causes vibrations in its surroundings. When another body with a similar natural resonant frequency to the first receives these vibrations, it absorbs energy from it and starts vibrating at the same frequency in a sympathetic manner. For example, a trained singer can hold a note causing a tuning fork tuned to the same frequency to vibrate. For the oscillators of a watch movement to be able to synchronize with each other, they have to be closely tuned. Imagine a small child trying to synchronize steps with an adult: he or she is unlikely to synchronise for more than a few steps as the systems are too dissimilar to resonate. Or imagine yourself pushing a child on a swing: the child and the swing make a natural pendulum, which will have an inherent natural frequency (speed of swing back and forth). If you push at the wrong frequency (too fast or too slow) then you are likely to block the motion and slow the swing down; however, if you push at or near the natural frequency of the swing then you will increase the amplitude (distance the swing moves) of the child/swing system. In horology, the phenomenon of synchronized motion has fascinated watchmakers since the time of Christiaan Huygens (1629-1695). Huygens, inventor of the pendulum clock, was the first to discover the resonance of two separate pendulum clocks, which he logically surmised should keep slightly different time. When hung from a common beam, however, the pendulums of the adjacent clocks synchronized; subsequent researchers confirmed that the common wooden beam coupled the vibrations and created resonance. The two pendulums functioned as one in a synchronous manner. In the eighteenth century, Abraham-Louis Breguet demonstrated his mastery of the physics with a double pendulum resonance clock. An outside shock slowing down one of them increases the speed of the other one by the same amount; but both will strive to get back in resonance, averaging and minimizing the effects of the outside influence as they find their rhythm. What was true for Huygens’ and Breguet’s clocks is just as true for Armin Strom’s wristwatch. Straps: delivered with a blue alligator strap and stainless steel double-folding clasp.